Featured in Evening Standard, Sarah Ryan of New Blood Art selects artists she would invest in. From 30th August 2018 - click for link. An exhibition of new landscape paintings which look towards on uncertain future. Dystopian themes have influenced the theme belying the celebratory feel of these new works. Join Mailing List for further info here. 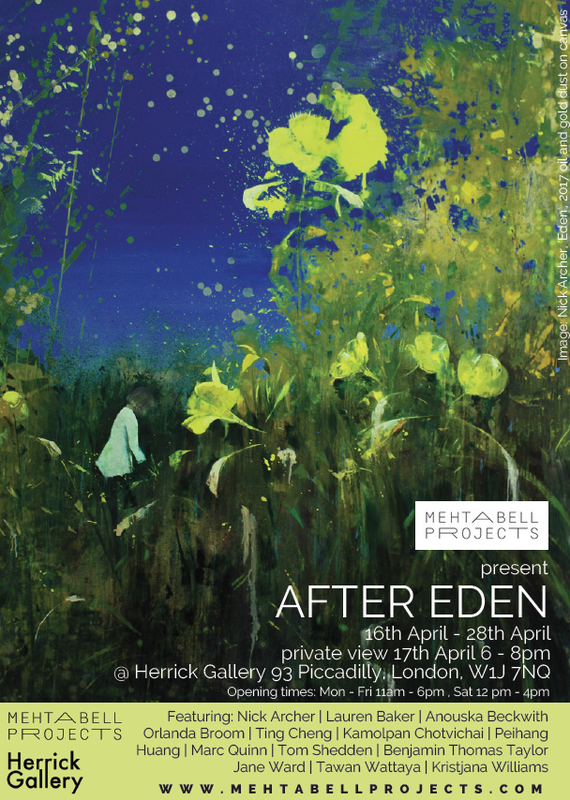 ‘After Eden’ celebrates the diversity and richness of the natural world and hints at its fate and potential decline at the hands of man. Mehta Bell Projects are pleased to present a carefully curated collection of artists that explore these concepts, investigating the complex relationship between man and nature and the potential consequences of the human pursuit for knowledge and power. 'After Eden' uses the fall of man after his banishment from paradise, as a starting point for a broader discussion about the state of the world we live in today. Messums Wiltshire is pleased to announce its inaugural exhibition of 2018, Fresh Paint. Displayed in the Long Gallery, Fresh Paint will showcase a mixture of established and emerging artists, from Royal Academicians to those just out of degree shows based around the country. Artists will include Orlanda Broom, Tom Hammick and Stephen Chambers RA as well as a slew of exciting new painters including Katherine Maple. The thematic strand through this diverse range of paintings, which weaves them all together is colour. Apart from being critically lacking in the winter scenery, many cultures mark their New Year celebrations by using bright, cheering colours in the form of fireworks or costumes. The use of optimistic hues symbolise — like our exhibition — the hope and the promise of the year’s opening months. Fresh Paint nods to these celebratory traditions by noting the important colours of other cultures and focusing on vibrancy, dynamism and saturation in order to banish those cold and grey winter days. 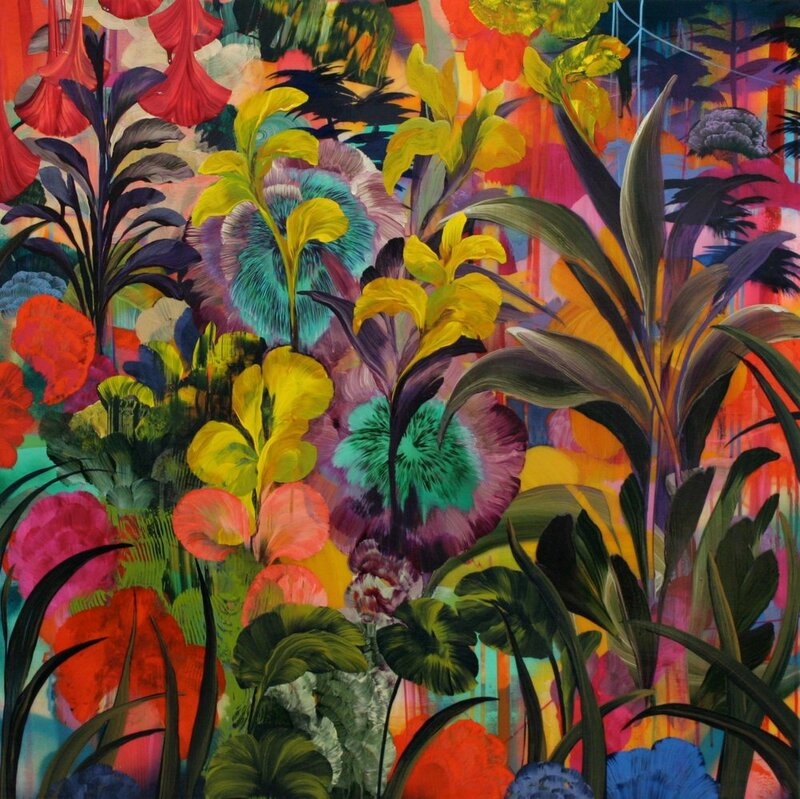 Orlanda Broom’s practice takes two distinct forms: lush, exotic landscapes and abstract pieces. 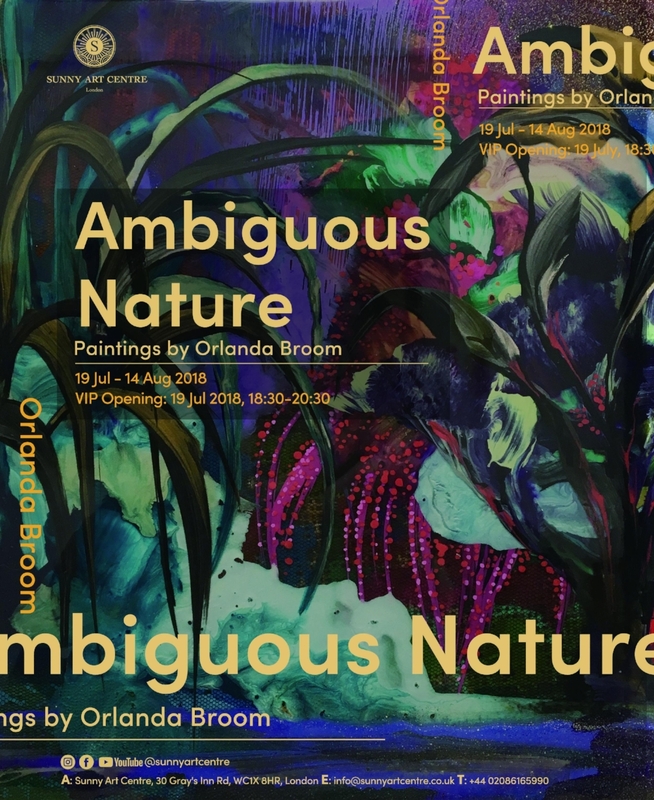 Connecting these bodies of work is a strong sense of colour, references to organic forms and the exploration of the mediums she works with. The abstract paintings are created through a process that involves no intervention with tools or brushes, just the flow and manipulation of the medium on the canvas. 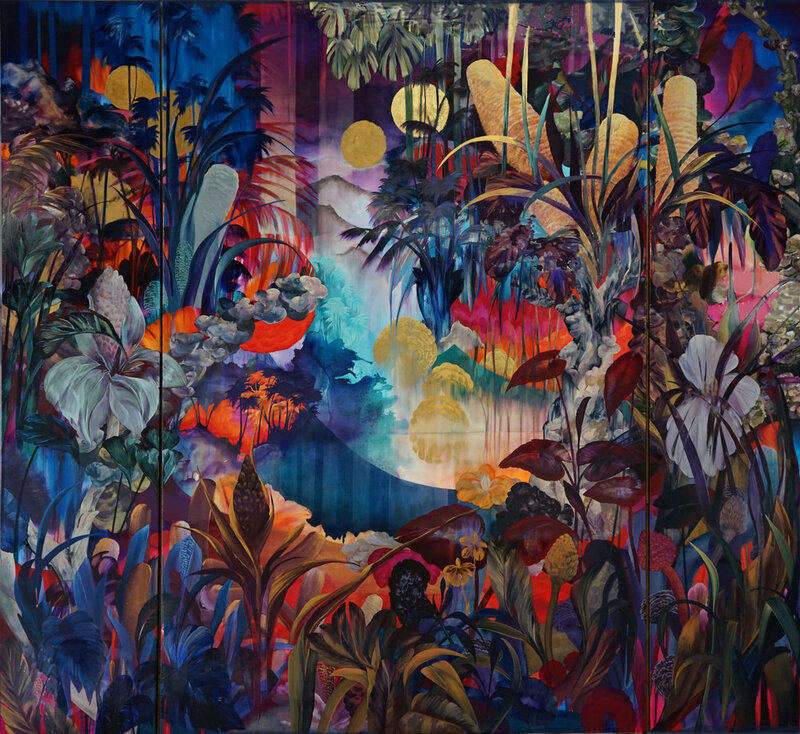 Her landscapes represent fantastical, re-imagined places, which in some sense are a rose-tinted view of the natural world. The surface joyousness is tempered by an uneasy sense of abandonment, a place untouched and timeless but a paradise that would ultimately ensnare. I was very happy to be selected for Dentons Art Prize and also to win the staff choice award, Dec 2017. 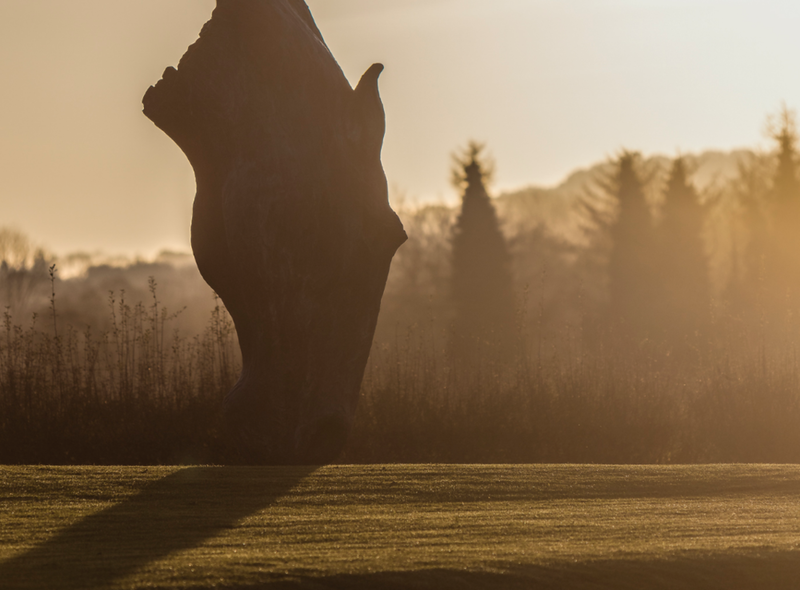 The Dentons Art Prize was launched in January 2016 in collaboration with curator Niamh White and artist Tim A Shaw. The competition aims to support diverse and dynamic artists as they embark on their careers. It is a biannual monetary award of £5,000 that is given to one artist by a panel of independent judges. 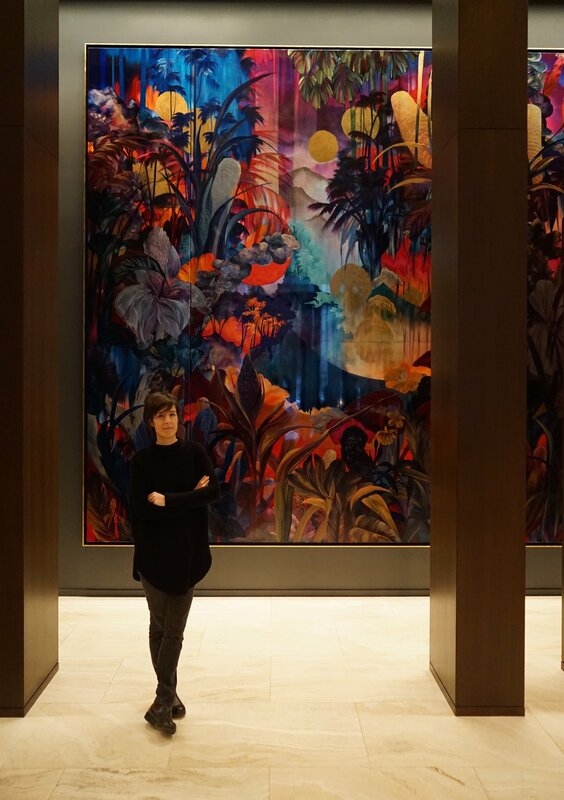 Large scale painting commissioned for the Four Seasons, Down Town NY. Installed in the lobby of the recently opened hotel. The painting references Manhattan's modern history. Time-lapse and short interview here. 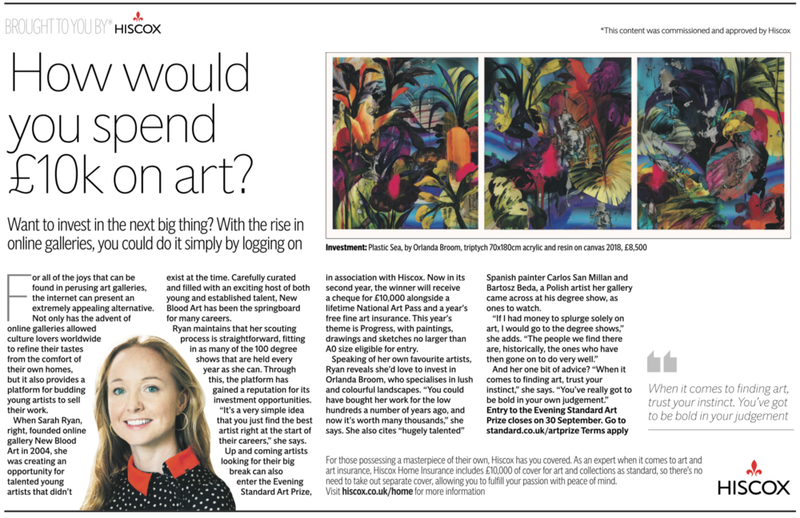 Article by Sarah Ryan, founder of New Blood Art on investing in art. I was invited to be included in the giant collage by Sir Peter Blake that covered Mandarin Oriental, London during renovation works (row three, seven from the left!). Five of my paintings hang in the Rosebury Room at the Mandarin. Three large scale paintings commissioned for a home in Mustique.